You are currently browsing the CycleStreets blog archives for March, 2011. We're pleased to announce that our GeoVation bid, 'Helping Campaigners Campaign' has been shortlisted from the 155 ideas submitted to GeoVation! The proposal is for an extensive suite of tools that will really help cycling campaigners around the UK – people who are already enthused – to be more effective in their work. It will build on the basic reporting facility in our Photomap and its fleldgling categorisation system. These groups – large and small, national and local, are the people on the ground who work make cycling better. They're already enthused, so we need to give them as much support as possible. However, there's a way to go yet – firstly we are invited to develop the idea at the GeoVation Camp, 25 – 27 March. The best ideas, hopefully including ours(!) will then go forward to the final pitching session, the GeoVation Showcase, on May 4th. all of whom have written quotes of support. Please let us know if you would like to add your group to the list. Cyclists would pinpoint problems (points/lines) on a map, e.g. lack of cycle parking, hostile roads, absence of needed route, poor quality cycling conditions, etc., with a photo if available. Planning applications could also appear automatically where the data is available. Others can publicly comment on each submission and add local knowledge. Examples of best practice elsewhere in the system can be pulled in (e.g. as example solutions). We're pleased to announce that the journey planning limit has been doubled to 200 miles (320km). This is well over a day's cycling! Mobile users should bear in mind that long journeys result in more data being sent over the wire so a slower response should be expected. The generation of the route and its metadata naturally also takes a little longer. 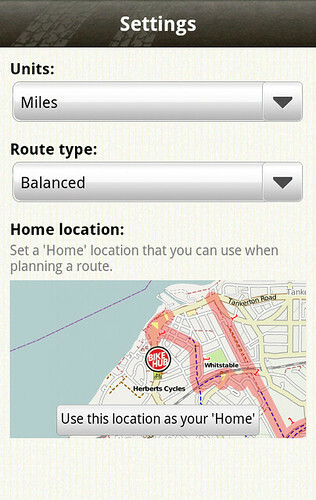 The UK Bike Hub levy released a free iPhone bicycle journey planning app in October, using CycleStreets routing. This was later upgraded to become the world's first vibrate & voice cycle satnav. 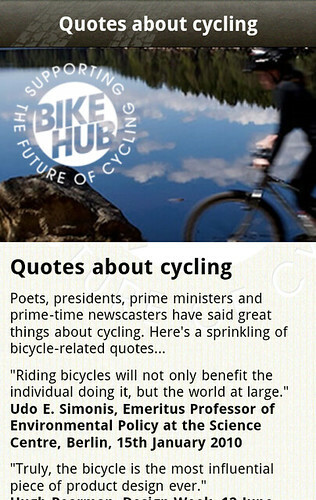 Bike Hub funds have now enabled the creation of an app for Android phones. This is also free, paid for by UK bicycle suppliers and bike shops. The iPhone version of the Bike Hub app has had it for a couple of months and now the Android app gets it too: 3D satnav functionality. The Bike Hub Android app is published under the Travel & Local category in the Android Market Place. The journey planner supports multiple waypoints. 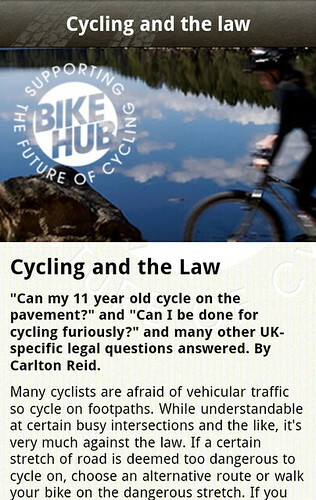 It allows for the saving of 'favourites' and has a 'More' section with articles on the Cycle to Work scheme, the law pertaining to cycling, and loads of quotes about cycling and bicycles. The app size is 3.4mb. Some Android phones have a small onboard memory capacity so the option to save to SD card overcomes this. It's a facility that is set in the app package. Not all phones support this. 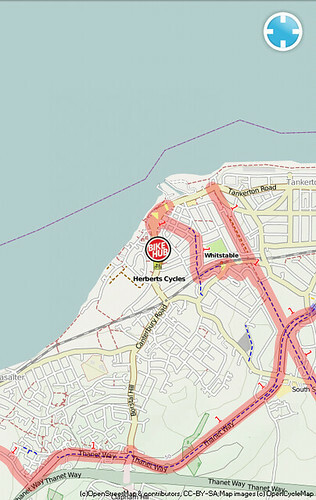 The Bike Hub Android and iPhone apps use cycle-specific routing from Cyclestreets with fast/balanced/quiet routes plotted on the OpenCycleMap via the community-developed OpenStreetMap. Here are some screenshots of the new app! Click to make bigger. Our new brochure promoting CycleStreets for Local councils around the UK is now available, and hundreds of copies will be posted out this weekend! Naturally, we're keen to see OSM-based CycleStreets used as widely as possible, so that as many people as possible can be helped to start cycling or find better routes. So we've printed 1,500 copies for distribution to Councils and related organisations. We're encouraging them to commission customised cycle journey planners, like West Sussex County Council have, or simply to link to us, like Surrey Heath, Devon, Chester, Lancaster, and more are doing. Customised planners provide the best possible visitor experience and raise funds for the project. We'd particularly like to thank Ayesha Garrett of LondonLime who did the design work for us at a next-to-nothing price, by way of support for the CycleStreets project. If you ever need a designer, we can strongly recommend her as someone who will produce great results, quickly and remain always unfailingly polite! Thanks, Ayesha! 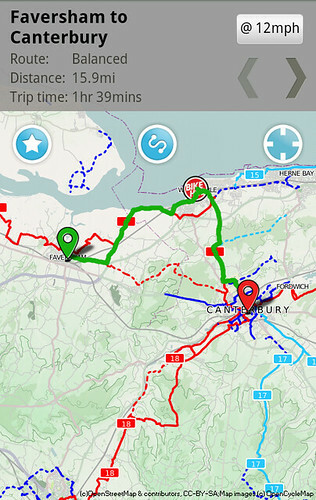 We're pleased to announce the launch a customised cycle journey planner for West Sussex County Council! We hope that this will be the first of many Local Authority sites based on CycleStreets (and thus OpenStreetMap), although quite a number already have links to our main site. Read more about the services we can offer Local Authorities in our new brochure.